I have Paris on the brain. I am roughly half way through my first read-through and hand edit of My Grape Paris and every day I am immersed in memories of the year I attended la Sorbonne. My Grape Paris will be the fifth book in my GRAPE series and will slot in between My Grape Year and My Grape Escape, during the year when Franck and I lived in the 5th arrondissement just behind Nôtre Dame and I studied medieval French Literature. Many people react to this suggestion with a guttural groan and think, Ugh. That's just for tourists. Still, I challenge you to find a more magical experience than a bateau-mouche canal boat ride along the Seine after dusk has fallen. The lights of the city are lit and you are transported to the Paris that lives in our dreams - gliding past the huge clock on the Musée D'Orsay, sliding underneath the famous bridges, and turning around at the base of the glittering Eiffel Tower. We ride the bateaux-mouches at night almost every time we go to Paris. It never gets old. This is the view you can enjoy with your authentic mint tea on the roof of l'Institut du Monde Arabe. On our last trip to Paris we stopped by the Île Saint-Louis for Berthillon ice cream at midnight with our friend Joëlle (who had just bought Clem a pink Eiffel Tower embellished with rhinestones which Clem is proudly showing Franck behind the camera). If you are planning an evening including the Bateaux-Mouches and Berthillon ice cream, you may as well plan a picnic on the Seine to round off your soirée. Pick any spot on the cobbled banks of the Île Saint-Louis or the Square Barye at the tip of the island which is usually a haven of bucolic greenery in the heart of Paris. Pick up baguettes, saucisson, cheese, fruit, and whatever else strikes your fancy from one of Paris' many markets, shops, or grocery stores. Also, don't forget a knife or two, glasses, and bien sûr, a bottle of wine. This medieval market street in the 5th arrondissment of Paris was in our old neighbourhood, and we went there several times a week. It is where Julia Child did her market shopping when she lived in Paris and an astounding number of famous people lived in and around this continually animated street. In A Moveable Feast (highly recommended reading before you visit Paris) Hemingway wrote about "that wonderful narrow crowded market street which led into the Place Contrescarpe" and lived only steps away. The market stalls and shops which line the street are completely closed Sunday afternoon and all day Monday, but are open on the other days of the week. The most entertaining times are Saturday and Sunday morning when you really find the market in full swing. Not to be missed. Clem, Franck, and Camille roaming around the steps where Romans used to lounge to watch gladiator fights. Franck introduced me to this hidden treasure of Paris, which luckily for me happened to be located on my walk from our apartment on the rue des Fossées Saint-Bernard to my classes at the Sorbonne. Lutèce is the name for the Roman settlement that later evolved into Paris. 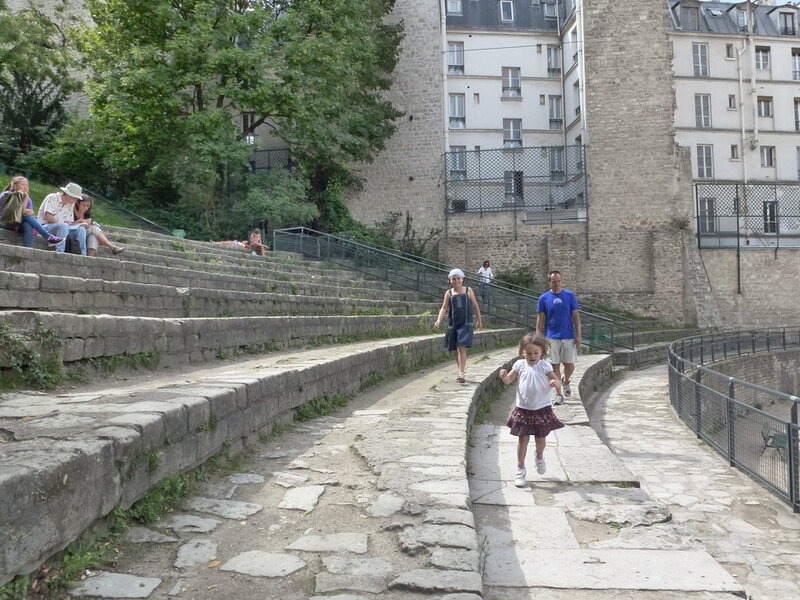 Just off the rue Monge, there is a heavy set of wood doors and if you push them open...voilà...you will discover an excavated and restored Roman amphitheatre from the Second Century AD. It was discovered when work was being done in the Monge neighbourhood in the late 19th Century. Victor Hugo was one of its first champions and argued for its restoration and preservation. Now it the Arènes de Lutèce is a city park, perfect for a picnic or watching the local men play a spirited game of pétanque. The plaque by the door says, "It was here in the second century A.D. that the municipal life of Paris was born. Ten thousand men could keep comfortable in the arenas of Lutèce where jousting and gladiator combat was followed by wild animal fights, presentations of ancient comedies and dramas. When passing before this first monument of Paris, consider that the city of the past is also the city of the future and that of your hopes." For me, the Arènes de Lutèce is hands down one of the most magical spots in Paris. This suggestion is hardly original, but to me I never wish to go to Paris and not pay an hommage - even a brief one - to the Eiffel Tower. The fact that it is visited by hundreds of thousands of people every year takes nothing away from its magic. I don't need to go up it every time (but when we do, we always buy the less expensive tickets for the staircase to walk up to the second level - less of a line-up and a great way to compensate for our prodigious pastry consumption in Paris). After dusk its lights are turned on to "glitter" mode every hour on the hour for five minutes, so set your watches. I love the Musée D'Orsay and the Louvre. In fact, the section of My Grape Paris I am editing right now is about the night Franck took me through all the back corridors and rooms of the Louvre when he was working there. Camille checking out the books at Shakespeare & Co. The iconic Shakespeare & co. bookstore has certainly become more touristy since Franck first took me there in 1991. However, for a book lover like me it is definitely on the "not-to-miss" list. This spot in the 5th arrondissment (steps from Saint-Michel) is a left bank literary institution and was the center of literary life in Paris for such writers as Allen Ginsberg, William Burroughs, Anaïs Nin, Henry Miller, James Jones, and James Baldwin. It has also been home to the countless "tumbleweeds" - vagabond writers and intellectuals who slept in the beds wedged between the nooks and crannies of the stacks. Buy a book here and make sure it gets stamped inside with the beautiful store stamp. Paris is so full of things to do and experience that often we forget to do that most Parisian thing of all, wile away some time in a Parisian café, simply watching the world go by. There is no more authentic way to take part in the Parisien lifestyle. Have "amour" for this post? Enjoyed this? Dive into My Grape Paris and the other books from my bestselling Grape Series - available in both ebooks and paperbacks.